On Tuesday, September 16, 2014, the Smithsonian’s National Museum of American History partnered with WETA television and the National Endowment for the Humanities to present “The Roosevelts: A Conversation with Ken Burns.” The live webcast featured filmmaker Ken Burns, whose latest project, The Roosevelts: An Intimate History, began airing on PBS on September 14, 2014. The webcast was moderated by the Smithsonian’s Christopher Wilson, Director of Experience and Program Design at the American history museum and included historian Clay Jenkinson and Roosevelt biographer Geoffrey Ward. With an online audience of high school students representing 32 states, the District of Columbia, as well as India, Canada, and Spain, the panel discussed the making of the film and the Roosevelts’ lasting legacy as one of the nation’s most important political families. The National Museum of American History’s chair and curator of the Division of Politics and Reform, Harry Rubenstein, also joined the panel and provided a number of Roosevelt artifacts from the Smithsonian National Collection as fascinating visual components to the program. Joining the panelists at the Smithsonian in Washington was a live studio audience of students from C.D. Hylton High School in Prince William County, Virginia. The very engaged student audience both online and at the museum discussed the legacy of the Roosevelts with the panelists and were able to take a close look and examine the Smithsonian Roosevelt artifacts. The wide-ranging conversation covered varied topic from how Theodore and Franklin rank among other American presidents and their possible responses to the contemporary political climate, to the way in which Eleanor Roosevelt shaped the role of the First Lady and Franklin Roosevelt’s presidency, to the roles of historians and how they do their work and present pictures of the past. 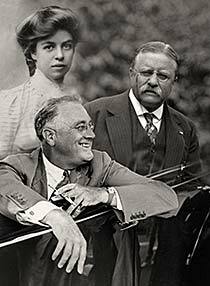 Through a combination of film clips, exclusive interaction with the museum’s objects, and the panelists’ comments, viewers, and audience members not only learned about the Roosevelts, but experienced the excitement they continue to bring to the public decades later.